Heading into the All-Star break, it was a good time to be a Denver Nuggets fan. 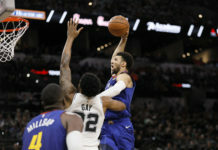 They were 1.5 games ahead of the Sacramento Kings for the eighth playoff spot, with Portland Trail Blazers and the New Orleans Pelicans not far behind; but there was a bit of comfort as the Nuggets were playing some of their best basketball of the season. In a roller coaster of a season, the tides have turned, and it’s hard to believe that it’s coming to an end. Not with the result that many wanted either, as the Nuggets have dropped not only three games straight, but their three most important games of the season. 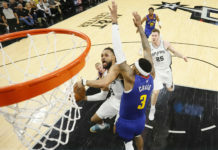 It’s even more difficult to believe that the team that we’ve been seeing as of late is the same team that in February scorched the Golden State Warriors by 22 points, tying the then NBA 3-point record, or the same team that a month later beat the defending champion, Cleveland Cavaliers in convincing fashion. But fast-forward to April Fool’s Day of 2017, things are not a joke; it’s all over for the Nuggets as they fell 114-122 to the Charlotte Hornets on Friday evening, a loss that might officially close the door on a successful 2016-2017 NBA season for Denver. After the game, Coach Malone took to Altitude TV to talk about the loss and his team’s effort. “Right now we’re having a hard time competing and playing for 48 minutes,” said Malone. Understandable, because after three quarters, Nuggets were up 94-86 and looked to be well on their way to a much-needed road victory. That was until the fourth quarter when Charlotte took over thanks in part to a 14-0 run and never looked back. Malone didn’t like the effort that was given in the 4th quarter. When asked about what he felt went wrong, Malone said it had to do with the second unit. While the bench didn’t offer much, Nikola Jokic had himself a great game. He finished with 26 points, 10 assists and 13 rebounds, for his sixth triple double of the year. Still, Malone was more worried about the effort and the fact that his team could not deliver a win. With another loss and Portland’s win against the Houston Rockets, Malone said he feels as if some guys have given up on the year. 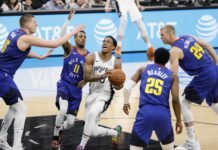 While the odds are against the Nuggets, there are still things to play for and there still is the slightest chance that they can make the playoffs, crazier things have happened. 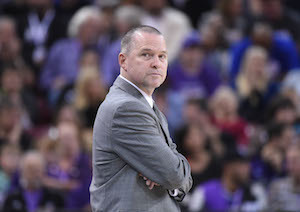 “I’m not worried about the playoffs right now, I’m more worried about us finishing the right way, if we do finish the right way, maybe other things happen, we give ourselves a chance,” said Malone. Well, that is not the case as Nuggets might’ve caught a lucky break. Big news came out during the game that Portland Trail Blazers big man, Jusuf Nurkic will miss the remainder of the regular season after being diagnosed with a non-displaced fibula fracture in his right leg. He suffered the injury in Portland’s 117-107 win over Houston on Thursday night. With the injury and the playoff chase still ongoing, albeit a small chance for the Nuggets, the season is not over.